The Handbook of Psychophysiology has been the authoritative resource for more than a quarter of a century. Since the third edition was published a decade ago, the field of psychophysiological science has seen significant advances, both in traditional measures such as electroencephalography, event-related brain potentials, and cardiovascular assessments, and in novel approaches and methods in behavioural epigenetics, neuroimaging, psychoneuroimmunology, psychoneuroendocrinology, neuropsychology, behavioural genetics, connectivity analyses, and non-contact sensors. At the same time, a thoroughgoing interdisciplinary focus has emerged as essential to scientific progress. Emphasizing the need for multiple measures, careful experimental design, and logical inference, the fourth edition of the Handbook provides updated and expanded coverage of approaches, methods, and analyses in the field. With state-of-the-art reviews of research in topical areas such as stress, emotion, development, language, psychopathology, and behavioural medicine, the Handbook remains the essential reference for students and scientists in the behavioural, cognitive, and biological sciences. In this fresh new offering to the Intro Psychology course, authors John Cacioppo and Laura Freberg portray psychology as being an integrative science in two ways. First, they have written a text that reflects psychology's rightful place as a hub science that draws from and is cited by research in many other fields. Second, this text presents psychology as a unified science that seeks a complete understanding of the human mind, rather than as a loosely organized set of autonomous subspecialties. As psychology moves rapidly toward maturity as an integrative, multidisciplinary field, the introductory course offers an opportunity to teach all of psychology in one place and at one time. This text reflects that evolution—and the authors' excitement about it. In this innovative approach to the Intro Psychology course, authors John Cacioppo and Laura Freberg present psychology as an integrative science that is highly relevant for students of all majors. The authors use a familiar chapter structure, providing an easy roadmap for the introductory psychology course, but the similarities with other approaches to introductory psychology end there. Integration extends in two directions, highlighting connections within psychology as well as between psychology and other disciplines. The writing and features are smart and engaging, and consistently illustrate the benefit of using multiple perspectives within psychology. Cacioppo and Freberg offer the best science possible, including exciting new research findings likely to expand students' understanding of psychology as a scientific field of study. Features and images coordinate with and enhance the text, providing many additional opportunities for critical thinking and connecting ideas. Psychology is evolving into an integrative, multidisciplinary field, and the introductory course offers instructors and professors an opportunity to teach all of psychology in one place and at one time. Cacioppo and Freberg offer a way to present a cohesive understanding of psychology as a highly interconnected and relevant hub science. The complexities of the brain and nervous system make neuroscience an inherently interdisciplinary pursuit, one that comprises disparate basic, clinical, and applied disciplines. Behavioral neuroscientists approach the brain and nervous system as instruments of sensation and response; cognitive neuroscientists view the same systems as a solitary computer with a focus on representations and processes. The Oxford Handbook of Social Neuroscience marks the emergence of a third broad perspective in this field. Social neuroscience emphasizes the functions that emerge through the coaction and interaction of conspecifics, the neural mechanisms that underlie these functions, and the commonality and differences across social species and superorganismal structures. With an emphasis on the neural, hormonal, cellular, and genetic mechanisms underlying social behavior, social neuroscience places emphasis on the associations and influences between social and biological levels of organization. This complex interdisciplinary perspective demands theoretical, methodological, statistical, and inferential rigor to effectively integrate basic, clinical, and applied perspectives on the nervous system and brain. Can religion and science coexist? Do they? Is religion hardwired in humans? The book, from the Chicago Social Brain Network, is the result of an extraordinary ongoing conversation among a group of highly respected scientists, physicians, philosophers, and theologians. Together, they share profound insights into the deepest questions humans ask and explore the invisible forces and powerful beliefs that shape our lives. Their insights reflect both humanity's latest science and its most enduring wisdom. Their answers and questions will challenge readers and reward them with a richer understand of who we are, what we share, and what it means. • What do we really know about human nature? • How do we see what we see, know what we know, feel what we feel? • How do people come to believe in God? • Where does empathy come from? • What are the health benefits of faith? • Where do you end, and others begin? • What do marriage, family, and friendship mean? • How can people repair the broken connections that keep them lonely? As technology has made imaging of the brain noninvasive and inexpensive, nearly every psychologist in every subfield is using pictures of the brain to show biological connections to feelings and behavior. Handbook of Neuroscience for the Behavioral Sciences provides psychologists and other behavioral scientists with a solid foundation in the increasingly critical field of neuroscience. Current and accessible, it provides in two comprehensive volumes the information they need to understand the new biological bases, research tools, and implications of brain and gene research as it relates to psychology. 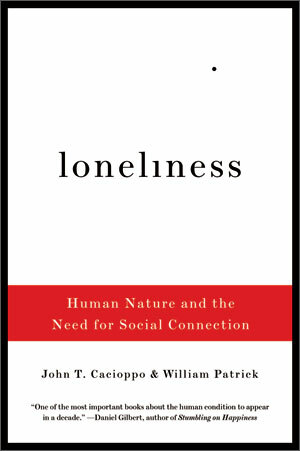 University of Chicago social neuroscientist John Cacioppo unveils his pioneering research on the startling effects of loneliness: a sense of isolation or social rejection disrupts not only our thinking abilities and willpower but also our immune systems, and can be as damaging as obesity or smoking. A blend of biological and social science, this book demonstrates that, as individuals and as a society, we have everything to gain, and everything to lose, in how well or how poorly we manage our need for social bonds. The Handbook of Psychophysiology, 3rd Edition is an essential reference for students, researchers, and professionals in the behavioral, cognitive, and biological sciences. Psychophysiological methods, paradigms, and theories offer entry to a biological cosmos that does not stop at skin's edge, and this essential reference is designed as a road map for explorers of this cosmos. Social neuroscience uses the methodologies and tools developed to measure mental and brain function to study social cognition, emotion, and behavior. 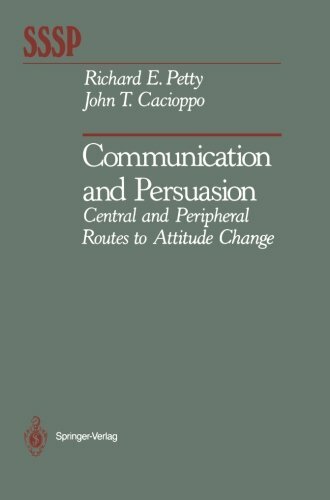 In this collection, John Cacioppo, Penny Visser, and Cynthia Pickett have brought together contributions from psychologists, neurobiologists, psychiatrists, radiologists, and neurologists that focus on the neurobiological underpinnings of social information processing, particularly the mechanisms underlying "people thinking about thinking people." In these studies, such methods as functional brain imaging, studies of brain lesion patients, comparative analyses, and developmental data are brought to bear on social thinking and feeling systems—the ways in which human beings influence and are influenced by other humans. The broad range of disciplines represented by the contributors confirms that among the strengths of social neuroscience are its interdisciplinary approach and the use of multiple methods that bridge disciplines and levels of analysis. Social neuroscience has yielded insights into such aspects of social behavior as social regulation, social rejection, impression formation, self-awareness, and attitudes regarding social groups. The studies in Social Neuroscience examine topics including the neural substrates of self-awareness and social cognition, theory of mind, cortical mechanisms of language processing, stereotyping, prejudice and race, and the special quality of social cognition. Neuroscientists and cognitive scientists have collaborated for more than a decade with the common goal of understanding how the mind works. These collaborations have helped unravel puzzles of the mind including aspects of perception, imagery, attention, and memory. Many aspects of the mind, however, require a more comprehensive approach to reveal the mystery of mind-brain connections. Attraction, altruism, speech recognition, affiliation, attachment, attitudes, identification, kin recognition, cooperation, competition, empathy, sexuality, communication, dominance, persuasion, obedience, morality, contagion, nurturance, violence, and person memory are just a few. Through classic and contemporary articles and reviews, Social Neuroscience illustrates the complementary nature of social, cognitive, and biological levels of analysis and how research integrating these levels can foster more comprehensive theories of the mechanisms underlying complex behavior and the mind. This collection of essays by a group of distinguished social neuroscientists provides the reader with an engaging overview of this emerging multidisciplinary and collaborative field. In the 20th century, the arbitrary barrier between neuroscience and social psychology was reinforced by the specialized knowledge required by each field and an emphasis on scientific work in isolation from other disciplines; the biological and social perspectives on mind and behavior developed for the most part independently of each other. Neuroscientists often considered social factors irrelevant or minimally important, while cognitive and social scientists tended to ignore biological constraints and mechanisms as leading to what they mistakenly thought of as reductionism. By the end of the 20th century, however, as those working in both fields were spurred by the common goal of understanding how the mind works, systematic collaborations between neuroscientists and cognitive scientists had begun. These collaborative efforts have already helped unravel aspects of perception, imagery, attention, and memory. These essays—by leaders in the field—reflect the range of disciplines engaged and questions addressed today in social neuroscience. Topics include maternal effects and chromatin modeling; "Oxytocin and the prairie vole: a love story"; pheromones, social odors, and the unconscious; and memory. A full understanding of the biology and behavior of humans cannot be complete without the collective contributions of the social sciences, cognitive sciences, and neurosciences. 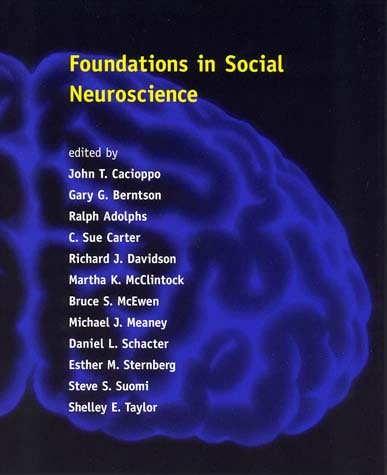 This book collects 82 of the foundational articles in the emerging discipline of social neuroscience. 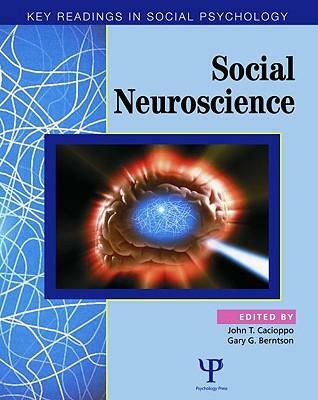 The book addresses five main areas of research: multilevel integrative analyses of social behavior, using the tools of neuroscience, cognitive science, and social science to examine specific cases of social interaction; the relationships between social cognition and the brain, using noninvasive brain imaging to document brain function in various social situations; rudimentary biological mechanisms for motivation, emotion, and attitudes, and the shaping of these mechanisms by social factors; the biology of social relationships and interpersonal processes; and social influences on biology and health. When people are in a certain mood, whether elated or depressed, that mood is often communicated to others. When we are talking to someone who is depressed it may make us feel depressed, whereas if we talk to someone who is feeling self-confident and buoyant we are likely to feel good about ourselves. This phenomenon, known as emotional contagion, is identified here, and compelling evidence for its effects is offered from a variety of disciplines—social and developmental psychology, history, cross-cultural psychology, experimental psychology, and psychopathology. The authors propose a simple mechanism to account for the process of contagion. They argue that people, in their everyday encounters, tend automatically and continuously to synchronize with the facial expressions, voices, postures, movements, and instrumental emotional behaviors of others. Emotional experiences are affected, moment-to-moment, by the feedback from such mimicry. In a series of orderly chapters, the authors provide observational and laboratory evidence to support their propositions. They then offer practical suggestions for clinical psychologists, physicians, husbands and wives, parents, and professionals who wish to become better at shaping the emotional tone of social encounters. Despite important developments in psychophysiology, no single book has reviewed the subject at a level that is informative to the specialist yet accessible to the interested nonspecialist. Principles of Psychophysiology is designed to fill this gap. Leading scientists review the foundations and recent advances in our understanding of psychophysiological responses and recording techniques—electrodermal, electromyographic, electrocortical, event-related brain potential, cardiovascular, electro-ocular, gastrointestinal, pulmonary, and sexual, and examine the applications of this behavior. The editors provide a comprehensive overview of fundamental issues involved in inferring psychological processes and states from physiological data. They review neurophysiological, psychoneuroendocrinological, and psychoneuroimmunological foundations of psychophysiology, and psychophysiological concepts and principles. Finally, they offer detailed tutorials on each psychophysiological system and response, and assess general analytic procedures across systems. A wide range of behavioural scientists, specialists in behavioural medicine, and their students will find this an indispensable sourcebook and guide. Within the field of social psychology, the experimental approach to attitude change exploded out of the starting blocks after World War I1 with great enthusiasm, considerable funding, and a number of highly productive and energetic researchers, under the leadership of Carl Hovland, Leon Festinger, Irving Janis, and their colleagues. It rapidly generated masses of empirical evidence and a wide variety of competing theories. Later reviews by William McGuire and others revealed more complexity in the empirical results than had earlier been anticipated. Available theories tended to speak to somewhat different domains of empirical studies, and so gave less help than might be expected in organizing this complexity. In the 1970s and 1980s, many once-active areas of attitude change research fell into the doldrums. seemed on the way to layering one successive generation of research on top of another, the inhabitants of each oblivious to its predecessors. In this last decade several researchers have kept the flame of attitude change research alive, most notably Richard Petty and John Cacioppo. They have in this volume produced a well-organized, systematic presentation of their work, and it is certainly one of the most important books on experimental studies of attitudes in the past two decades. 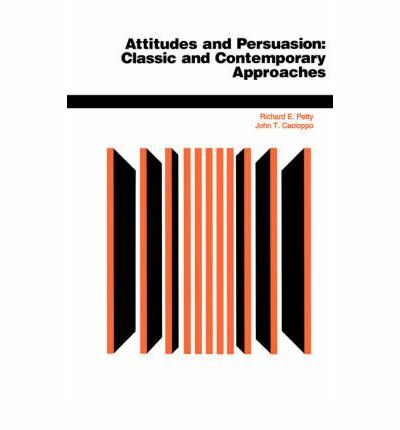 This classic text surveys a number of different theoretical approaches to the related phenomena of attitude and belief change. These theories are grouped into seven major approaches, each presented and evaluated in a separate chapter. Each contributes in an important way to a complete understanding of the persuasion process. Appropriate for both upper level undergraduates and graduates in the social sciences.